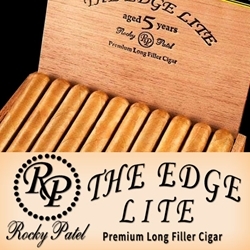 Offered as the mild side of the Edge blend by Rocky Patel, The Edge Lite are hand-rolled premium cigars that feature a seamless aged Ecuadorian Connecticut shade wrapper infused with a well-balanced blend of Honduran tobaccos. Being a milder version, The Edge Lite premium cigar by Rocky Patel is mild to medium-bodied delivering a smooth satisfying rich-creamy flavor with a nutty core accompanied with a hint of sweetness. An excellent premium cigar, connoisseurs everywhere love and embrace. If you looking for a great smoke at a great price, The Edge Lite by Rocky Patel are hand-rolled cigars that deliver time and time again. Smokers Discounts has made it easy and affordable to buy premium cigars online. Each of these styles, sizes and flavors are in stock and available at a low discount price. Call us for more details!